Our goal is to provide a home where people can come to restore inner peace and achieve their fitness goals by feeding off positive vibes from our energetic, enthusiastic, and knowledgable instructors. Nicole is our fearless leader, founder & owner. She has made fitness and health her life’s work. One of Nicole’s greatest joys is watching her amazing group of friends and clients reach their true potential, in and out of the gym. Nicole hopes that 360 Studio Naperville becomes the safe haven, home away from home, hang-out and overall provider of inspiration and growth she intends it to be for all of its members. Her certifications include 200 RYT Certification, Yoga Body Bootcamp Cert, PIYO Certification, Insanity Certification. Nicole was also nominated as one of the 15 most charitable women in the Western Suburbs. Although she didn’t take home the title, giving back to the community is a huge priority of hers. She Averages 2 fundraisers each year to support a local charity. Jill is deeply rooted in the yoga community throughout the western suburbs and has been teaching yoga for 10 years. After beginning her teaching career with CPY in Oak Park, she brought CPY to Naperville where she taught for many years and lead and co-lead teacher trainings in both hot and vinyasa styles of yoga. Jill expanded her wings to Hot Yoga Naperville where she developed their 200-hour teacher training program. Her main focus is bringing mindfulness and breath awareness to students and teachers. According to Jill, being a powerful teacher is understanding the power that exists in all of us. Her best guide is herself, and while she is comfortable admitting her flaws and working on them, she will encourage you to do the same! “Yoga is so much more than linking postures together, it is a whole operating system, and we could all use an update.” She has also added a few certifications to her name and has obtained her E-RYT 500 and YACEP. Is a certified personal trainer through the International Sports Sciences Association (ISSA) and graduated from the University of Minnesota with a degree in Business and Marketing Education. Eric was a 3-year starter for the University of Minnesota Football Team and was a captain his senior year. 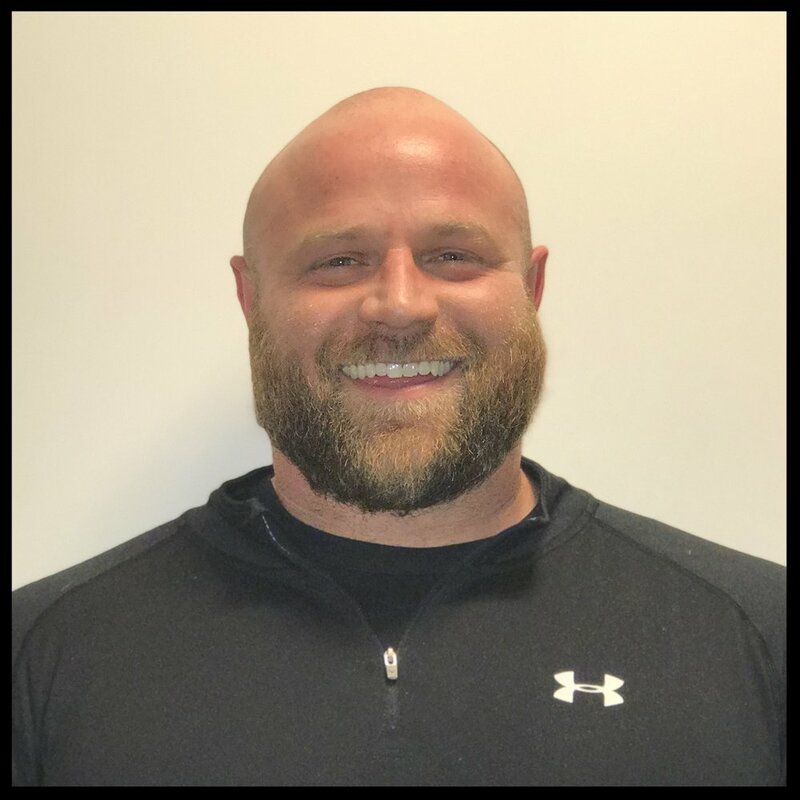 Fitness and strength training has always been an integral part of Eric’s life as an athlete and even more now as he competes in Strongman competitions. He currently holds the State Record in the Log Press at 360 pounds and the National Record in the push press at 425 pounds. Eric has extensive knowledge and experience in working with injuries after rupturing both of his patellar tendons in 2013 during one of his competitions. Rehabbing and training himself to get to where he is today is not only inspiring but has instilled Eric with the ability to work with all fitness levels and injuries. He truly exemplifies letting no obstacle get in his way. Eric would love the opportunity to help you reach your goals no matter where you are in your fitness journey, from beginners to elite athletes, he’s got you covered. Overall health and well-being have been a passion of Lori’s for more than 25 years. Her fun and motivating approach to working out invites all levels to achieve their personal best. She is certified through ACE Fitness and holds numerous of other certifications, including: Jillian Michaels Body Shred and Women & Running. When she’s not at the gym, you will see Lori running through the trails in Naperville. She is training for the New York Marathon. The will be Lori’s 14th 26.2 race — wow! Joey is a mom, wife, sister, daughter, instructor, and coach… but most importantly, she is passionate about inspiring others to achieve their goals in health and fitness! A guru for the past 20 years, her certifications include NASM group and youth certifications, Tabata, Body Shred, Maddog Spinning and Piloxing. Her favorite classes are the Tabata boot camps and small group HIIT. As she figures out this whole “aging thing”, she has learned that functional flexibility and strength building are huge factors in a healthy body and mind. As hard working and committed as she is, she is also a firm believer in the importance of “rest day” in other words “EVERYTHING in moderation except happiness and love – that needs to be in excess! It all started with a pain in my b--- (back!) Over time, the low back issue became chronic. I decided to explore yoga as a way to alleviate the pain. I can still recall my first yoga experience; at the end of class I was so tired I desperately needed a nap. But then I found myself going back to the studio and very soon I was practicing yoga three to four times a week. I learned to breath. While the physical benefits of a consistent practice are wonderful (yay becoming stronger and more flexible!) it is the mental component — the mindfulness, being fully present, feeling grounded and the lack of judgment that lets me just me. That keeps me coming back to my mat! But above all, it is my hope that yoga helps you discover the mind-body connection that lets you live more fully, more mindfully on and off your mat. Hairdresser by trade, fitness freak by choice. Helen has been teaching since 2000. When she first moved to America from the UK she gained a bunch of weight. After getting herself into a gym and starting a workout routine, the benefits inspired her to start teaching. From body pump to spin and now yoga, she enjoys the new lifestyle she has created for herself and others. Her lifestyle changes has motivated her to obtain several certifications inducing, Group ex AFFA, Spin, SpinPower, Fit Tour Cycle and Yoga Fit. The fitness madness started when she took a spin class and thought to herself, “Hmmm, I can do that and make it a lot more fun and a lot more challenging!” Mission accomplished. Her goal has always been to challenge each person in the room to do their best on that day. Love, passion and fun goes into every class she teaches; strength, bootcamp, cross training, cycle, barre, interval training, treading. The only thing this Brazilian can’t teach is Zumba – go figure! She is not joking when she tells you that she has run 30 marathons. Yep, marathons. She has lost count of half marathons and triathlons. Being a mom and a wife is her happy place… okay, a tropical resort would make her happy too —but true joy comes from being around family and friends. Sean started his yoga practice in early 2013 due to an injury from basketball. This path began purely as physical healing, which soon expanded into the emotional, mental and spiritual aspects of life. Through his teachings, he looks to assist students in their empowerment and transformation process both on and off the mat. Sound meditations have also become a cornerstone in his practice by providing live sounds from the didgeridoo, flute, charongo and song. Sean opens a space to help relax and let go within. 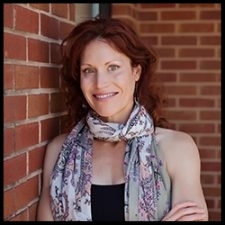 Mary Ellen (Mare) is a certified 500 hour yoga teacher, practicing yoga therapist, experienced barre teacher, life coach, and Reiki Master practitioner/teacher. She teaches a variety of classes at 360 Fit, including barre, restorative yoga, chair yoga, vinyasa, and hatha style practices. As a teacher with traditional training in the Sivanada and TKV Desikachar lineages, she brings a true love of yoga for it's benefits of calming the mind and creating healthier living. She teaches classes that are thoughtful in asana (postures), pranayama (breath), meditation, mudras, and mantra. She has experience working with students of all ages and abilities. She brings classical practice to her students and uses humor and joy to help them find a regular practice of yoga to suit their goals. Her intention is that students will bring their yoga out into their world and therefore live with more compassion and kindness. As a barre teacher, Mare combines original exercises with flexibility, strength, balance, and breath work. She challenges her students to stay present in their bodies, teaches modifications for all limitations, and encourages students to find body acceptance and self love. Her advanced training in anatomy and has developed a unique blend of exercises to build strong, mobile bodies with attention to joint, bone, and ligament wellness. Through education and personal experience, Mare's focus is on spinal health, using functional moves to create a body that is healthy in any season of life. Be careful getting to know Mandy! She can see things about you that you didn’t even know existed. Armed with over 500 hours of yoga training, her goal in life is to make you see yourself as a powerful, purposeful person on and off your mat. When she is not busy empowering you, Mandy counsels adolescents at a local hospital and nanny’s three precious boys. RYT 200 hour and Yoga Body Bootcamp certified, Kim creates an atmosphere where her students are comfortable with and inspired by their individuality so they can develop physically and spiritually. She believes that connection to the Divine power within is vital to the human experience and she strives to guide her students to this realization. She learned to use yoga and meditation to connect with the strength and clarity she needed to navigate through her daughter’s battle with Leukemia. Off the mat, Kim is proud of her 20+ year involvement with the Make A Wish Foundation as a Wish Granter, fund raiser and member of the Women’s Network. She loves spending time with her husband and two pre-teen/teenage daughters. Aimee began teaching barre classes in 2007. She opened and operated her own successful barre studio in St. Charles, IL in 2010. She moved back to Naperville in 2016 after she sold her business and is happy to share her experience at 360 Fit. She loves sharing this beautiful method of exercise with others and has seen the benefits as it helps us age more gracefully. She is continuing her education in anatomy of the spine and muscles and how they function so eloquently together. “I love the way Barre really does allow us to be our strongest selves by creating long, lean muscles. This is gentle method of strengthening, toning, and balancing the body without creating bulk in the muscles, ” Aimee says. Working with her is like taking a class from your best friend. She will teach you and challenge you. She spends most of the class walking around the room, adjusting and helping with modifications. If you are looking for a fun, safe class and one that will leave you aching, in a great way, you found it! Laura Lipuma is a native to Naperville and thoroughly enjoys being a part of the community. Laura has been certified by the American Council on Exercise (ACE) since 1996. Over the years she has taught many types of classes including Step, Strength, Boot Camp, Cycle, Interval and TRX. She has multiple certifications including; Schwinn and Cycle Reebok, Functional Training, Strength Training, Core Training, Functional Health Promo, TRX and Weight Management and Interval Training. She truly enjoys meeting members, pushing them to achieve their health and fitness goals and being a part of their everyday journey. Mike is a flooring contractor by trade, and a yogi by choice. Currently, Mike teaches Hot Yoga, Vinyasa and Yin Yoga classes, while still maintaining a daily practice. Divorce drew him to yoga, but the benefits are what encourage him to continue practicing yoga on and off the mat. Four years into his personal practice, the natural progression was to attend teacher training with Suddha Weixler at the Chicago Yoga Center. Mike is currently a 500RYT and started teaching in 2013. At fifty some odd years old, he says that he is in the best place he’s ever been in his life. His mantra is: “Through yoga we re-establish the mind–body–spirit connection, allowing us to live more fully in the present.” As a father of three, Mike is adamant about being physically, mentally, and spiritually fit for the future. The strategies he learns while practicing yoga help decrease stress and bring him peace. Whether you are a first-timer or a life-timer, Mike invites students to join him on this journey. Sean began practicing yoga in 2004, as a way to heal a neck injury. Within weeks, she noticed a shift in her mind, body, and spirit. Sean believes that yoga creates the harmony and balance she needs, and wants in her life. After many years working in the hospital corporate world as a nurse educator, she made the switch to teaching yoga and has never looked back. She completed her 200-hour RYT in 2012, and Life Coaching with Debbie Williamson. She has had the opportunity to participate in numerous workshops and training programs with some of her favorite teachers. These include Eric Paskel, Kino Macgregor, Seane Corn, Dave Farmar, Phillip Urso and others. Sean believes that moments on our mat translate to amazing moments in life. By practicing yoga, we create space for BIG possibilities, as we let go of mediocre choices. After retiring from competitive swimming after 10 years Claire found herself struggling to find a workout regimen outside of the pool. With her mom, Lori Brady, being an experienced group fitness instructor she was no stranger to trying out numerous classes and formats, but nothing seemed to click. Frustrated with her inability to find a workout routine that suited her style she stumbled into her first yoga class at the age of 16. And just like that it clicked. In the summer of 2017 Claire took the leap and entered her first RYT200 teacher training, and was forever changed. Learning skills such as breathing, moving with intention, and calming her mind on her mat quickly evolved to much more off her mat as well. Claire is a strong believer that everyone can and should do yoga because of its countless mind and body benefits. She guarantees that you’ll leave her classes with a smile on your face and a calmness in your heart and mind. If Claire isn’t practicing or teaching you can find her snuggling with her kitten Senna, snowboarding, or in class as she is still working on her bachelors of arts in business management at North Central college. Danna first tried yoga in college seeking a way to reduce stress and improve flexibility. It wasn’t until 5 years ago where she realized the deep mental, emotional and spiritual benefits that came from a deeper practice. Wanting to strengthen her own personal practice she enrolled in the 200 hour program at Prairie Yoga in Lisle, Illinois. It is there where she fell in love with Restorative Yoga and was drawn to its powerful healing and recuperative effects. Guiding her students to “let go” and teaching them to receive rather than do the pose are two of her favorite elements of restorative yoga. Danna truly sees yoga as gift that has helped transform her own life. Being inflexible and not particularly graceful, Marylee was afraid to try yoga for years. When persistent back and hip problems left her no choice but to give yoga a shot, she finally discovered that you don’t need to be flexible, graceful, or even coordinated to practice yoga! Everyone can experience its many physical, mental, and spiritual benefits. After realizing that, she was eager to learn more and earned her vinyasa yoga teacher certification. She loves to help people connect to their practices in their own individual ways and see how much fun they can have in the process. Diana reluctantly took her first yoga class only because her fitness club’s rules required that she stay in the building in order to use the daycare. Fast-forward fifteen years and Diana’s kids were out of daycare but she was still into yoga. She launched into teacher-training, got her 200-hour RYT certification and never looked back. She takes and teaches classes ranging from Restorative to Hot Flow. She pours her passion into building creatively themed, high-energy Yoga Sculpt classes that use thoughtfully selected music to make you sing and smile as you sweat. Ellen first came to the practice of yoga in 2005 to help heal injuries sustained through years of martial arts training. A student of hot yoga since 2010, she gravitated toward both the discipline of the practice and the health benefits of the intense heat. Ellen completed her CYT 200 hour training at Prairie Yoga in May 2013 and has been teaching ever since. Ellen views yoga as a continuously evolving process that can be approached with a fresh perspective in every class for everyone. She believes that understanding the anatomy behind the movements and the “why” of the postures is essential for students in developing a mindful practice. Once the postures are deeply felt and understood in the physical body, the mind is then free to focus on the more spiritual aspects of practice. She is passionate about the role of yoga in recovery from addiction and is focusing on the integration of mindfulness practice and therapy in her career as an addictions counselor. She runs “Sober Yogis”, a social recovery network at the studio on Sunday evenings. She enjoys teaching a variety of class styles, including traditional Hatha, Vinyasa Flow, Power Fusion, Restorative and Fitness.